Anil Balchandani is a Partner at I.R.B. Law LLP. 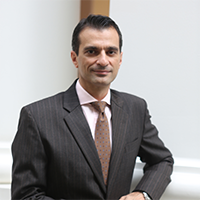 Anil received his Juris Doctorate in Law from Singapore Management University in 2012. He received his Bachelors in Science in Electrical and Computer Engineering with college honours at the Carnegie Institute of Technology, and with university honours at Carnegie Mellon University in 1994. He also double majored in Industrial Management at the Graduate School of Industrial Administration at Carnegie Mellon University. Anil practiced as a professional engineer for approximately 8 years. He also holds a Diploma in Intellectual Property Law from National University of Singapore. Anil is also a registered Patent Agent at the United States Patent and Trademark Office. Anil has worked with a wide range of industries within the intellectual property realm, including engineering, manufacturing, mechanical equipment, biology and pharmaceutical, music, entertainment, information technology and computer science. Registering a Patent in Singapore?